Google's annual enterprise-focused event, Google Cloud Next took place last week in San Francisco. The three day event showcased Google's achievements during the past year as well as exciting announcements for its future in the cloud space. The event also included keynote presentations, and many cloud-focused sessions. 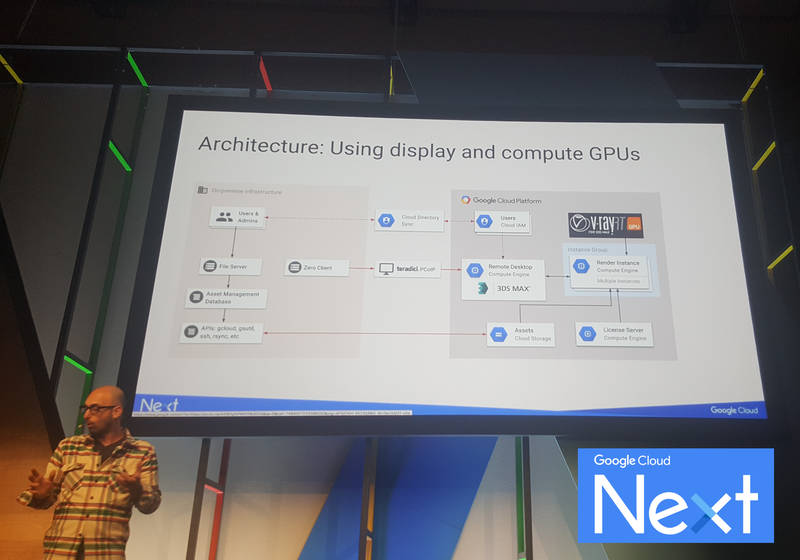 During these sessions, Google featured Teradici, bringing attention to our Cloud Access Software and its ability to help companies visualize and interact with GPU applications from the cloud. There is no doubt that demand for GPUs in the cloud is growing, so Google devoted a whole session to putting GPUs to work in order to visualize 3D-intensive applications. "Supercharge performance using GPUs in the cloud" included customer use cases and demos using examples from Schlumberger and Autodesk 3DS Max. Google Cloud Solutions Architect, Adrian Graham, highlighted Teradici in the presentation which featured our Cloud Access Software on Google Cloud Platform and connecting from a secure PCoIP Zero Client. Teradici's PCoIP technology, Zero Clients, and Cloud Access Software were mentioned as pivotal architecture pieces to enable 3D visualization using GPUs on the Google Cloud Platform. Learn more about Teradici Cloud Access Software here.